This year, we will be hosting Thanksgiving with some dear friends, gathering as many into our home as can fit (and then some). I’ve been looking forward to this for weeks. I’ve already started cooking. 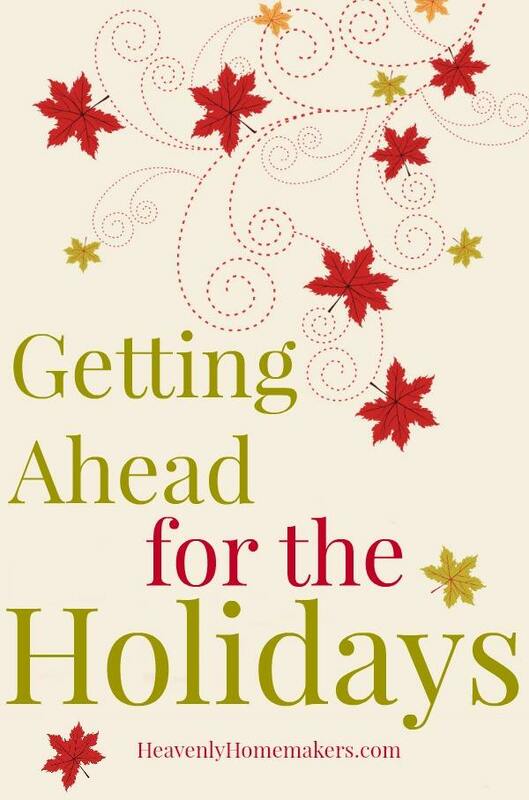 Sharing the Getting Ahead for the Holidays series with you has helped with my own planning – so thank you! This has been fun! Below, I’ve outlined my ideal plan for knocking out everything on my to-do list. Will it all happen exactly according to plan? It never does. At least the list helps keep all my thoughts in one place! I would love to hear what all you are planning to prepare ahead this holiday season! Thanks, Laura, for the great ideas! Thank you, Laura. This has been SO helpful. I wish I could share what I will make ahead, but I don’t know our plans yet. We’ll either bring parts of the meal to my sister-in-law’s house, or we’ll invite my husband’s brother and his wife to join us for a scaled down dinner for four. Regardless, I know you series will come in handy, both now and in years to come. We are hosting 12 at our house this year. I made the cranberry sauce and stuffing bread already. I used the stir and pour recipe! I’m going to prepare the stuffing, green bean casserole, and yams the night before. I’m really excited for the printable!! I love having my food plans written down and organized. I love your recipes & your writing. This is exactly what I needed to help me get the timing right as I prepare, the take food to my mother’s for our family gathering. Maybe this year I’ll be happy and relaxed instead of disorganized and hurried (i.e. cranky) on Thanksgiving Day. Thank you! I have really enjoyed this series. Also, I like when there are printables to go along with it. Thanks! I will make cinnamon rolls for breakfast, sweet potatoes, cranberry sauce, dough for rolls,turkey and gravy, dressing, corn pudding and desserts ahead. Mashed potatoes will made on the day and kept warm in the crock pot. I too love leftovers. We decorate for Christmas the day after Thanksgiving and having no cooking to do on that day is a real blessing. Thanks for all your great ideas. Thank you so much for this series – it’s great to have someone who has lived it out, sharing it! We’re just bringing dishes to another house for Thanksgiving, but I’ve shared some of your ideas with them, and I will defnitely use them when I’m the host! We tend to have a laid back thanksgiving. The turkey will be put in the roaster the night before. The potatoes in the Crockpot the night before. We do not do most side dishes. And pie is put in the oven mid morning so it will be warm. Thank you for all your work. I’m sure I will try some ideas in the future. Congratulations on the birthday — 40 is FANTASTIC!! I am totally catching your vision here! I will be pinning this for the next time we host for sure! I love the idea of spreading out the workload and actually being able to enjoy the day! Yea! Sooo excited about this series and appreciate you sharing your timeline and all the recipes. I am not good at the timeline thing and talking while doing anything else! So I really needed this. I already made the green bean casserole for my family with mixed veggies and ground beef and they loved it!!! We hosted last year but will be at MIL’s this year. Don’t know what we are asked to bring yet. But since we won’t have leftovers, I’m hoping to make and freeze these ahead and pull them out the day after Thanksgiving so we have a premade meal and lots of leftovers. This has been a great series. Thanks! Thank you for this great series! I will be making the turkey ahead again…such a timesaver! Also the pies, green bean casserole, and you’re stir and pour rolls. This has been very helpful. I’ve gotten ideas for new recipes, too. This will be the first year to make the turkey ahead of time. Thank you. oh it’s so helpful to have someone else do the organizing :D!! your printables are sure pretty! This series has been helpful but since I’m Canadian, and our Thanksgiving is past, I’ll be using these tips toward Christmas preparations; which begins now. I’d like to bake one kind of cookie each week, so I don’t have so much at once. Thanks for the time line, I plan to freeze more, and try the dinner rolls this week. Wow! This was an amazing series and I can’t wait to try some of it out. Thanks for all of your hard work on the website! It is a continual blessing and am thankful for you and your family (even though I have never met you). It is so nice to have other sisters in Christ fighting through every day life. I have learned so much from you.Thank you!!! Thanks you so much for posting this series. What a wonderful Thanksgiving gift to all your readers! Thank you for all the tips and recipes for preparing for Thanksgiving. Now that we are finished (for now) with the floor make-over (ripping out very old carpet and putting in laminate) and the dining room table can be taken out of the kitchen–I look forward to getting a few things under way so we can be ready for Thanksgiving Day. Blessings on your Thanksgiving Day with all the food and fellowship. Thank you for this, Laura! The organization/timeline part of getting ahead is usually my biggest challenge. I have used your tip on making turkey ahead of time! I love lists to stay organized. Thanksgiving morning is meant to be a relaxed time sipping coffee and reading the ads! Thanks for the list and the recipes! I have enjoyed this series immensely. Thank you so very much for this series, Laura! You have eased my annual Thanksgiving prep anxiety more than you will ever know! I usually make my mashed potatoes the day before Thanksgiving, which is still a hassle and takes time and energy that I’d rather spend elsewhere. This year, I’m going to make them a week before and freeze them. I’m fairly certain this will revolutionize my life! I may try freezing more side dishes if I get the chance! Thank you, Laura! Thanks for some great ideas. Hope you have a wonderful Thanksgiving! These are great ideas….I’m gonna save ’em for another year because we’re not doing any of the cooking this year–a first!! This list is perfect. My tired mommy brain was having trouble putting all the pieces together from each of the other posts. Love the printables! Now to make my sweet potato casserole and get it in the freezer! Thank you so much for the recipes and printables, Laura. I really appreciate the work you did. Going to try a couple of these this year, especially the green bean casserole and stuffing muffins! Thank you so much for sharing all of these recipes! You are such a blessing! We usually have the traditional fare. However, this year we are going to have a ham to mix it up a bit. My husband is not a huge poultry fan, so that is another consideration. I love how well organized your time line could make me! I would like to have the rolls prepared ahead of time, and the pies as well. We make cranberry sauce, using agave nectar or splenda. It turns out great! We love sweet potato casserole, but not Green bean casserole. One year we added Eggplant parmigiana.